Home ADVICE BUILDING OR RENOVATING Designing the ultimate laundry, all the tips and tricks you need! Designing the ultimate laundry, all the tips and tricks you need! We recently discovered Zephyr and Stone — sisters and best friends Ania and Kasia who are mad for building, renovating and designing homes! We’re sure you’ll love their luxe yet highly functional approach to interior design as much as us. Today they’re sharing all their tips and tricks to designing the ultimate laundry — one that’s functional, gorgeous and ticks all the boxes! 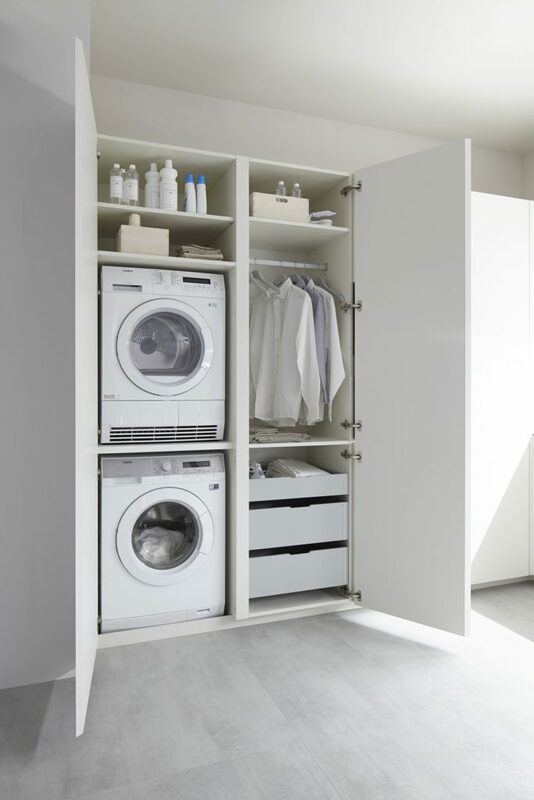 Whatever the size of your laundry, and whether you’re building or renovating, it’s vital that its design is both practical and functional. So where do you start and what are the essentials? We’ve put together a list of our top tips for creating the ultimate laundry. So first things first, where is the perfect place to locate your laundry? Our favourite location is flowing directly from the kitchen or butler’s pantry, with a second access from a hallway in your home. That said, it’s not always practical or possible to relocate a laundry here, particularly if you’re renovating an existing home. 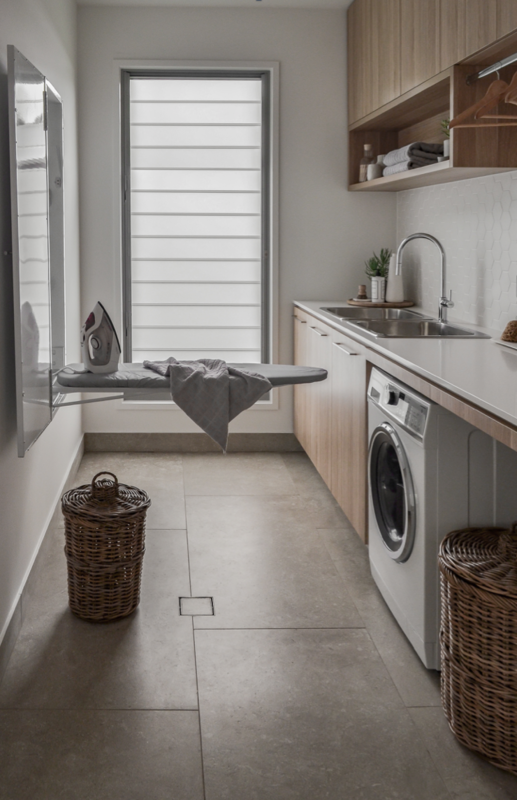 Ideally your laundry should be placed in a services area, away from bedrooms and living areas, so that when your washing machine or dryer is in use, it doesn’t resonate throughout resting or entertaining zones. If you’re building on a small lot and space is a commodity, it can be practical to locate your laundry off your garage so that it serves as an access or hallway from your garage into your home. 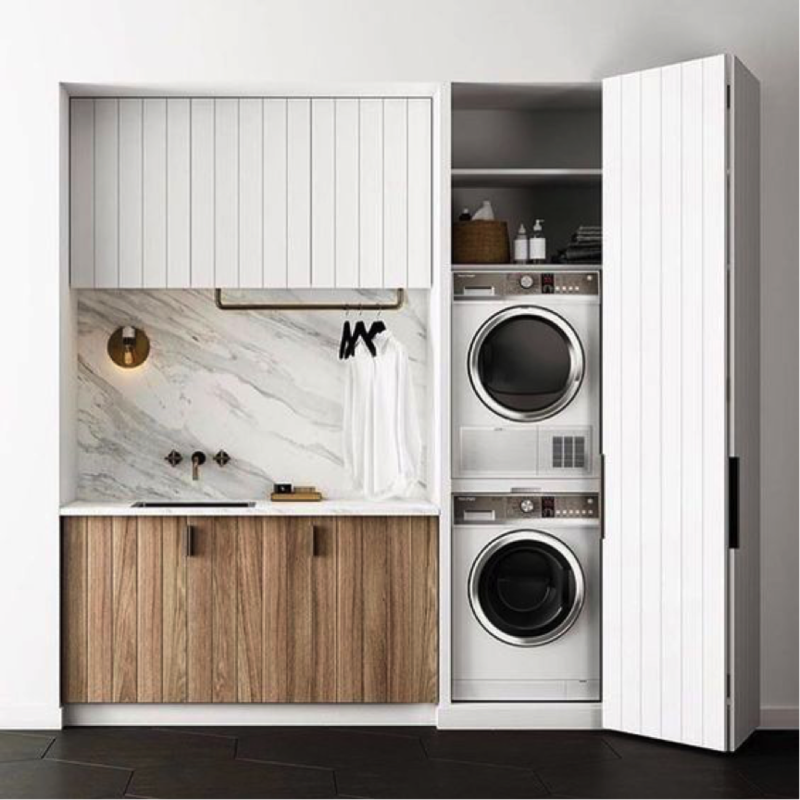 If you don’t have the luxury of a dedicated laundry room, consider integrating your laundry into a bathroom or kitchen, or within cabinetry off a hallway, away from living areas. Whichever way you go, ensure your laundry has reasonable access to a clothesline, or external drying area. 1) Do I want a front or top loader washing machine? 2) Will I have a separate washer and dryer or an all in one? It’s vital you choose your appliances before moving onto the next step. Your next step is to consider how you will use your laundry and what items you will store. 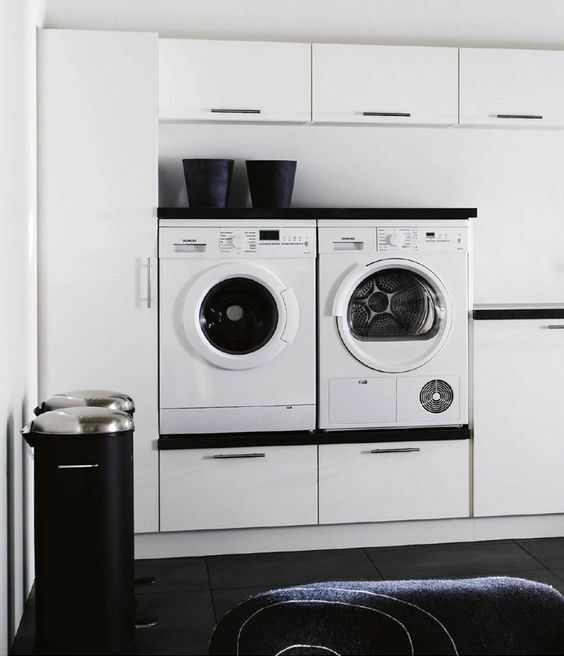 Design your space to reduce double handling, and streamline the washing, drying and folding process to save time. Consider the workflow and ensure there is enough space to move around safely and comfortably. Who will be using the laundry? It may be appropriate to elevate appliances to reduce bending or crouching. If possible, consider positioning your washing machine between your sink and laundry baskets, allowing you to transfer clothing directly between these areas. Positioning the dryer next to or above the washing machine reduces double handling, and ensures you have bench space close-by so clothing can be folded or sorted directly from your dryer. Include a space to store an air dryer if you use one, or a rail to hang wet clothes. In the laundry below, we allowed for both shorter clothing and full length items to be hung up to air dry, ready for ironing. The ironing station is positioned on the wall adjacent to this area where it can be easily accessed. Ample storage is gold in your laundry. Include a combination of cupboards, overheads, drawers and bench top space for the ultimate storage hub. Overheads are ideal for storing chemicals up high out of reach of children and the inclusion of a tall cupboard allows you to store brooms, mops and vacuum cleaners out of sight. 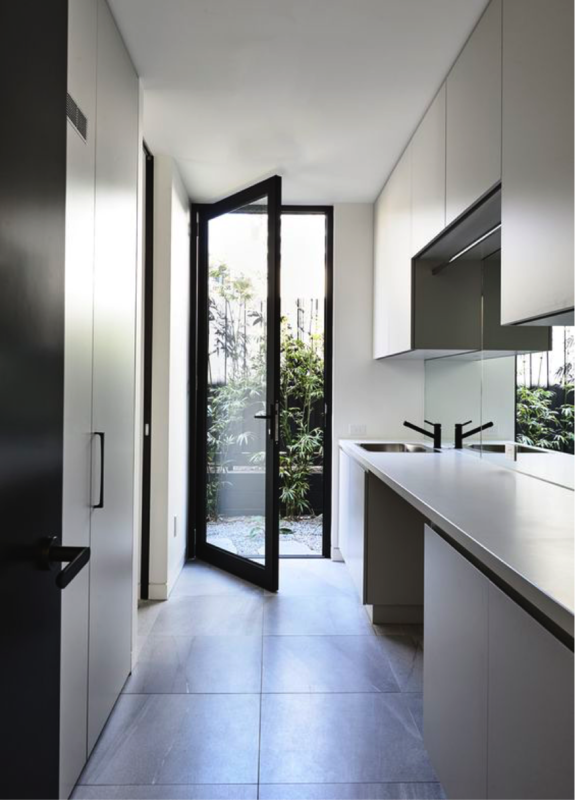 Opting for custom, built-in cabinetry is the best way to maximise and optimise the space you have, but is more costly than flat pack or standard storage options. 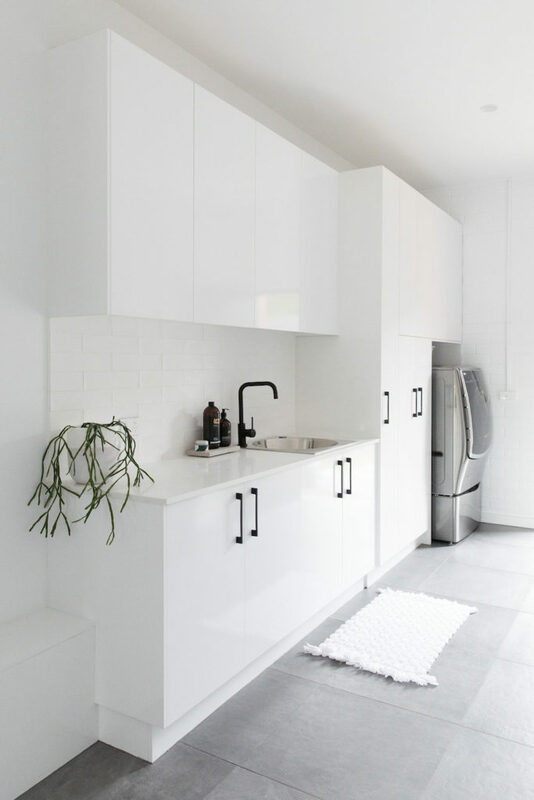 Either option can result in a functional and aesthetically pleasing space, so consider what’s best for you and your budget. Installing a rail to allow clothes to dry on hangers reduces ironing, and the addition of open shelves allows you to display plants, vases, candles, soaps or fresh towels – finishing touches which give your laundry that designer look. So now you’re almost ready to design your new laundry! But wait, what about all those little dos and don’ts, and luxuries that you just must have? Here’s our list of top tips to take your laundry from fab to extraordinary! Make sure your bench is deep enough for your appliances and sinks! 600mm is the standard depth of a kitchen bench, however this is often not enough for a laundry. Remember that laundry sinks are generally bigger than kitchen sinks and you’ll have hoses tucked in behind your washing machine. 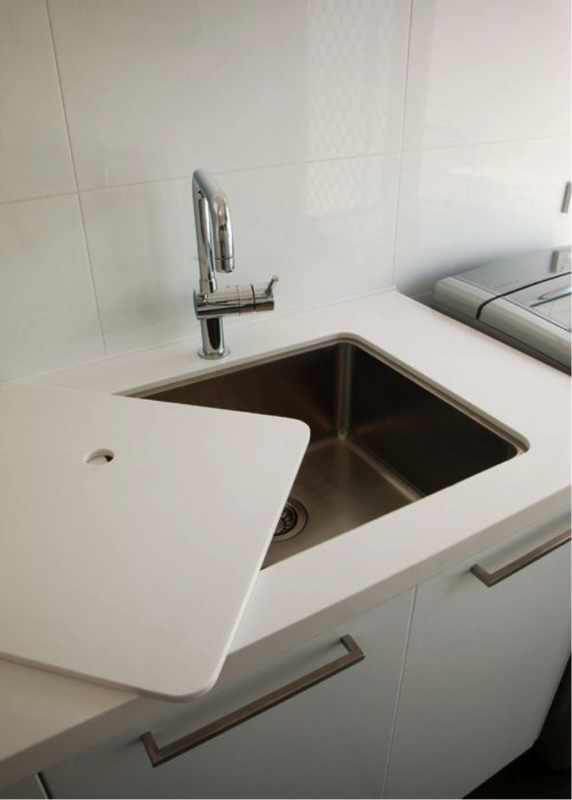 We opt for a minimum 650mm deep benchtop in laundries. 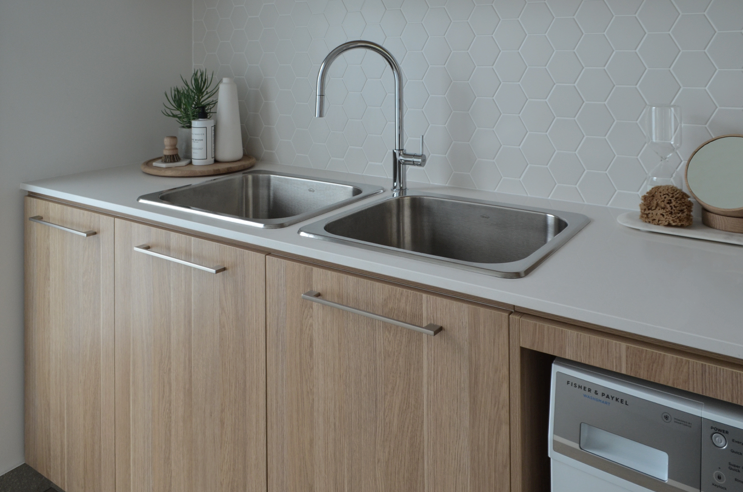 There are a variety of both undermount and drop-in sink options on the market. If you have the space, opt for two sinks side by side, as we did in the laundry below. Make sure you have enough bench room behind your sink to fit your tap mixer, or you can place it to the side if space doesn’t allow. A mixer with a pull out spray allows for easy cleaning of your sink and washing items. We opt for the Robinhood IC1300. These are fabulous as they have a built in light and safety timer which switches power off to your iron once the timer is done. The ironing board is height adjustable and folds away effortlessly into its own purpose designed cabinet. We install these into a 90mm thick wall recess to ensure we achieve a neat finish. Ensure your wall cavity frame is deep enough and suitable for installation and allow for an electrician to run suitable power for this. A pair of large slide out bins will take your laundry to next level. We use Hideaway Bins, which can be integrated into your cabinetry and allow you to sort whites and darks separately. The strong plastic bins lift out easily so they can be hosed or washed out occasionally to avoid odour build up. 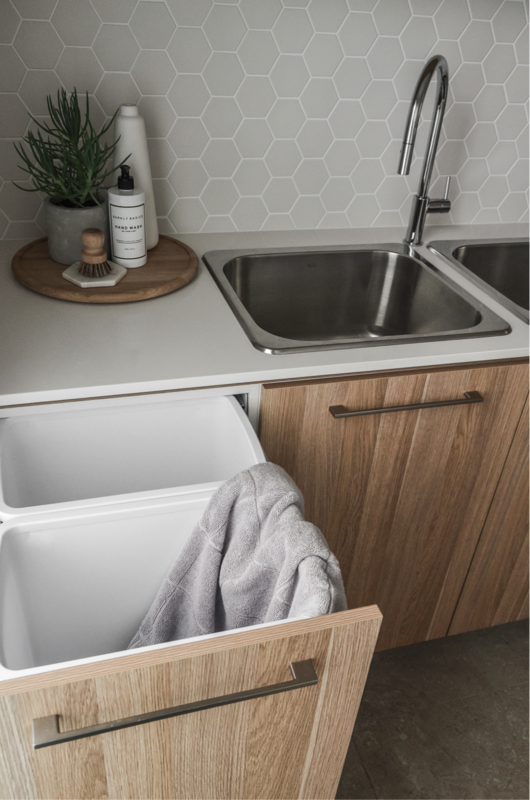 If you opt for a stand-alone laundry basket, make sure you allocate space in your laundry design under the bench or in a corner to allow for this. Include direct external access to your clothesline where possible, and ensure you have adequate ventilation through a window and/or an exhaust fan. Ensure there is adequate lighting through windows or a skylight and consider installing task strip LED lighting within your cabinetry. You may also want to consider incorporating a drying cupboard, particularly if you live in a cold area. This will speed up the rate at which your clothing will air dry, and keeps drying clothes out of sight. Just ensure you consider ventilation to prevent moisture or mould buildup. Washing machine plumbing taps and power points can be hidden away in a cupboard next to the washer. Ask your cabinetmaker or handyman to drill a large hole at the back of your cabinet next to your washing machine, to pass your cables and hoses through. Make sure your flooring is suitable for a wet area and is non-slip when wet. If you’re tiling, consider running a short tile band skirting up the wall to prevent damage in case of water leaks. 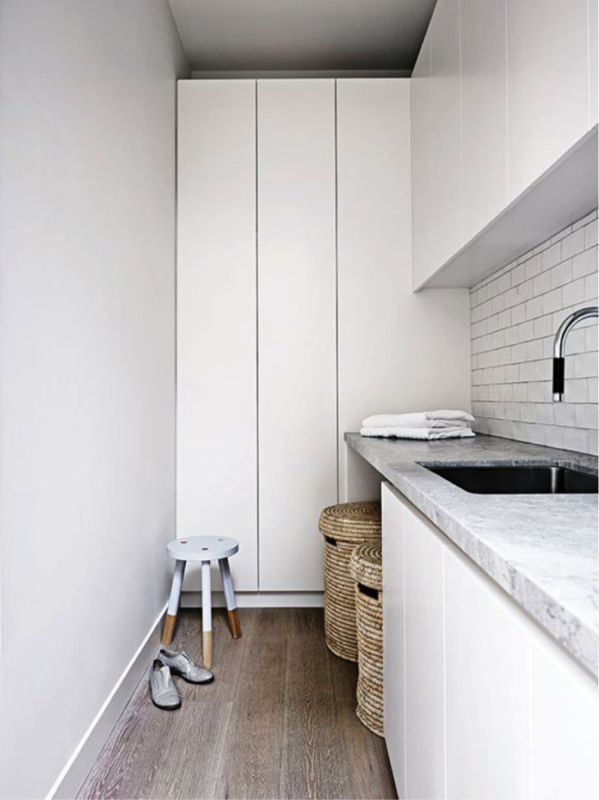 Use a feature splashback above your bench top and sink for ease of cleaning, and to give your laundry that designer look. 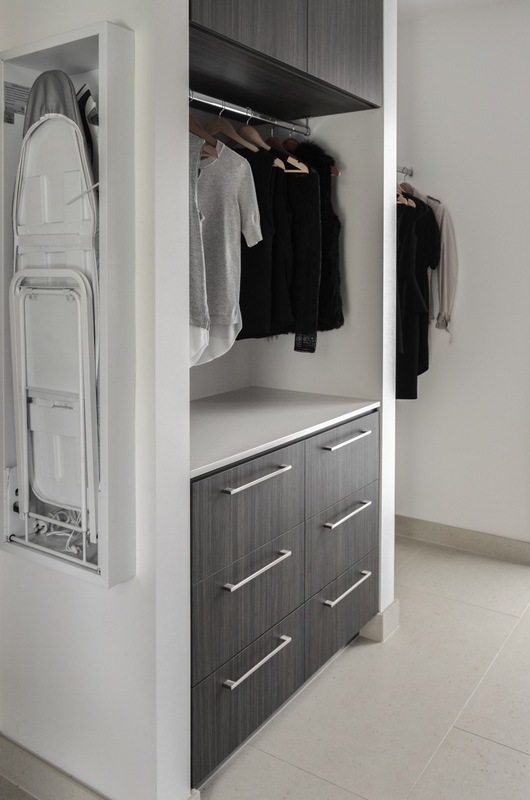 If you are building or renovating a double storey home, incorporating a laundry chute is essential! It can be installed inside a wardrobe or hidden behind cabinetry off a hallway, directly above a laundry cupboard. We use a cabinetmaker to construct the chute out of laminate board, and always install the chute high enough so that young children cannot climb into it. As with any modifications in your home, be sure to check for any local building regulations before commencing. 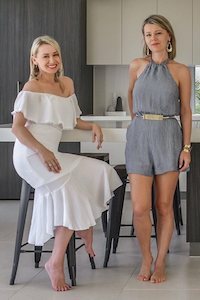 Sisters and best friends, Ania and Kasia spent their childhoods immersed in the happy chaos of their parents’ numerous renovations. It’s not surprising that they were both drawn down the same rabbit hole — building, renovating and designing homes. With over fifteen years experience in the building and interior design industries, they have joined forces to create Zephyr + Stone. They are passionate about creating functional and gorgeous spaces.